FBC Jax Watchdogs: BAH HUMBUG!!! SBC President Tells Pastors: Your Disobedient Members Have Until 12/31 to Pay the Tithe - No Grace Period!! BAH HUMBUG!!! SBC President Tells Pastors: Your Disobedient Members Have Until 12/31 to Pay the Tithe - No Grace Period!! Yesterday on Ronnie Floyd's blog, he announced to all Southern Baptist Convention (SBC) Pastors that they must hound their non-tithing members weekly, to let them know Ronnie has set a deadline of December 31, 2014, for them to come into obedience and tithe on their 2014 income. The IRS's deadline to collect what you owe them for the prior year is April 15. At least they give you 3 1/2 months to account for your 2014 income and then pay your final tax amount. Not so with the SBC. 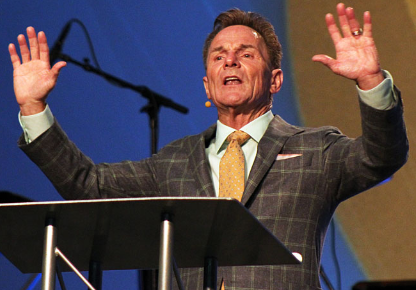 Ronnie Floyd says to the people who owe his SBC churches money: you have until December 31st to pay up. No grace period, your 2014 10% tithe is due at 11:59 pm December 31st, or you will be disobeying Jesus. I love the graphic that is at the top of Floyd's post yesterday, shown at right. Shows the date of "31" circled - that is the DEADLINE you recalcitrants! And then the man agonizingly praying (knowing he MUST find the $5000 he owes his church or be cursed), then the hand dropping the cold hard cash in the offering plate. What a Christmas message! You have until the 31st to pay up! 1. Church members should not give to any other charitable organizations in December, UNTIL they get caught up with their required 10% tithe for all of their 2014 income. It's so simple, isn't it? This Christmas season, your priority should be to stuff the coffers of your church with cash, not helping the poor, or caring for an elderly parent, or even being generous to missions to Lottie Moon. When you walk out of the store, think of Ronnie's words before you drop your change in the red buckets. Sorry David Platt, but the IMB should get no funding until these church members square with the church and fork over 10% of their gross income. Church members need to make "the church" the #1 priority in their lives. After all, "The Church is the Reason for the Season". Wonderful. 2. SBC Pastors have an obligation to hound their people this Christmas season that they need to come into line with God's requirement by paying their full 10% on ALL 2014 income by December 31st. Notice, this is the message pastors need to tell their church members "repeatedly" during the Christmas season: fork it over. During this season, go back NOW, and look at "ALL" your 2014 income and make sure you haven't forgotten to tithe on any of it! Ronnie goes further, by actually giving the SBC pastors an action plan on what they should do! He tells them to be generous to missions - but of course, the first 10% goes to the church, not to any other organizations, including the IMB. This shows you where Ronnie's heart is this Christmas. Your obedience ultimately in 2014 was not how well you did your job, or served and sacrificed for your spouse and family, or if you were generous to people in your life that needed your help. Your obedience in 2014 is going to be determined - in Ronnie Floyd's warped world - by whether you forked over 10% of "ALL" your 2014 income to your local church. In Ronnie Floyd's mind, if you don't tithe, you probably aren't a Christian, and you most certainly are going to be cursed in 2015. See previous Watchdog posts hyperlinked below, documenting Ronnie's views on the tithe. Pastors, you elected Ronnie Floyd, but you know he is full of hot air on this. Disregard what he is saying. Just be joyful and each week just simply THANK your church members over and over and over for their generosity in 2014. People do give according to their consciences, and there is absolutely nothing you can say that will change what they give. Your giving will probably decrease if you pull this stunt in your church at Christmas time. Your members are mostly hard working people who sacrifice so much for their families and even if they give a small percentage, it is a sacrifice to them. Be thankful you have members. Don't beat them like Ronnie suggests. Remember, pastors, Ronnie Floyd looks to none other than Robert Morris when he gets his theology on giving and tithing. Review this previous Watchdog post that contain videos of how far off the chain Ronnie is when it comes to stewardship and tithing. He abused his church by using Robert Morris' "tithe or be cursed" nonsense. He even told church members they are probably not saved if they don't tithe. Don't believe me he said it? Go here and read it and WATCH it. On a snowy winter's night that was so cold. Says from on high, Ronnie Floyd. Drop your full 10% as it passes your row. Says our beloved Mr. President. And to follow the money wherever it went. Says the seminarian, Mr. Ronnie. But brought tens, twenties, even a Benjamin. Tithe-Tithe, Tithe-Tithe, to the SBC. We're so glad we elected, Ronnie. And with his beatings the pastor has bought. That's what really gets me about the pitch these hucksters make. Let's just concede for purpose of argument that they're absolutely right that yes, Christians MUST give 10% of their incomes as a tithe. But of course they don't stop there, no, God requires you to give that 10% TO THIS CHURCH. So if I'm a member of ronnies church I can't give my 10% to some worthy charity, or to buy needy kids toys for Christmas, or to pay for someone's medical care. No, God commands that instead I give it to Ronnie's organization so it can pay ronnies fat six fig salary and the note on the theme park sized megachurch property. If I believed that was the way God rolled, then I would think God was a real a-hole. Sorry, Ronny, but tithing is not required anywhere under the New Covenant. God's blessings are ours whether we give a ton or give a little; to teach differently is to teach legalism. "Since we are no longer a theocracy, the tithe is no longer operational." This is why I am no long SBC. They care less about people in the pews, their wants, their needs. It's all about the money now. And they wonder why the SBC is losing membership. I recall several years back SBC had over 2000 churches that failed to baptize one person in each of their churches. The most important issue is "money drives". What some of these good ole boys would like to do is put their congregants back under the LAW. "Without the shedding of blood there is no forgiveness" has been replaced by "let go of those dollars or you won't be blessed". Its a real shame that most of those sitting in the pews never take the time to read where the Law pertains to the Jew and the period of Grace pertains to the Church age. I assume on Wednesday nights the Sunday School Directors are to "PUSH" this to all the teachers for Sunday mornings whereby the "financial goals" can be realized. I think they would be better served to go fish like Jesus told Peter to do. 1) he only opens up campuses in affluent areas that can afford to give over ten grand a year per giving unit household. 2) because he's Charismatic he gets to claim to be a prophet who receives direct revelations from God daily. He uses this to convince his followers that God "told him" about the tithing and curses and you don't want to question or disobey God, do you? Springdale, AR is not as wealthy as Morris' select DFW campuses and most Baptists don't believe that God has anointed new 2014 prophets who are writing what amounts to a new book to "add to the bible" which is basically what this Blessed Life doctrine/heresy is. will always grow, Through summer sun and winter snow. How gullible are my members? Your man of god will teach me. To the tune of "I'll be Home for Christmas"
Someone on Twitter made a good point: Ronnie and his pals are quick to call for cutting federal spending but even faster to call for more "taxes" to pay for church expenses. Actually Ronnie isn't teaching The Blessed Life properly. I've sat through it many times. Your 10% tithe must be a FIRST fruits offering. If you don't pay your church the full 10% FIRST on any money you receive, then God is forced to curse ALL of your finances plus every other aspect of your life. Morris emphasizes that this specifically opens up your children to demonic attack. According to Morris' teachings you can't just "catch up" later because the curse is already in place because you've already stolen from God. Somebody needs to call Ronnie out on this. Either he is bringing the Blessed Life cursing system to the SBC or he isn't. Making his people catch up still results in their being under the curse only now they are cursed and have less money to spend on curse related expenses like hospital bills. It'll be interesting to see if Ronnie pushes the bonus First Fruits "Miracle Offering" at the start of 2015 like Morris does. Extravagant givers are then entitled to ask God for anything just like King Solomon did. scriptures as to the New Testament and giving....not tithing. Tithing is NOT required in the New Testament. Read the Word of God for yourselfe and quit being intimiated by these ignorant pastors who do not know the mind of the Lord. Giving in the N.T. is joyful giving and giving cheerfully and not under compulsion as this pastor is trying to pressure you to do. maker if you do not tithe. Get your financial freedom and read the word of God for yourself and if these SBC pastors do not like it, go elsewhere. These so-called men of God are becoming bolder with their antics and exposing themselves for what they are, CONMEN. I was a member of Ronnie Floyd's cult, er, church, from 1998-2001. The stuff I saw there would be a great whole 'nother blog. Don't know why this immediately comes to mind, but I remember Ronnie got irked with people leaving the service early (imagine the gall of walking out while "Pastor Floyd" is still in his pulpit) so what did he do? He ordered his goons, er, ushers to block their way out and refuse to let them leave until the service was over. That didn't last too long. I'm guessing either the local cops who doubled as security or some lawyer in the congregation told him that was a little bit illegal. But that's just how Ronnie rolls. Done with SBC....Tom Rich. This is really making me sad too. But this distortion on God's true commands and his word is enough for me to leave my reasonably moderate SBC church by the end of the year quite possibly then if doctrine like this is not confronted. (Oh, but they like to reason those who argue are really greedy, robbing GOD). Well lets look at the FULL teaching on Tithing then Folks. Not only is this teaching is a complete perversion NOT ONLY OF THE GOSPEL, Tom. Biblically, Mr. Floyd has ABSOLUTELY NO TORAH back-up to collect during a SHEMITAH year. Yes, this is a seventh year on the Jewish calendar, which one would have to follow in order to tithe. Wondering IS HE GOING TO TELL HIS business/creditor friends to drop loans and debt on Christian friends this year? That would be the true application for this year. (It is the year for releasing financial burdens and debt, isn't it?) Do you ever hear that application in churches? That would be the true application for THIS YEAR and no other. That is why pledging is the best way to fund an assembly. SO we have not only a misapplication on tithing but also a SBC president that is distorting the proper application of the LORD's commands in a Shemitah year. It did not hit me until this year the level and I mean the level of distortion on tithing laws some churches are teaching. Rambam, a famous Jewish Rabbi in the middle ages in his teaching states that the tithe is specific only the land of Israel. That reminds me of a story when I was a lowly undergrad. I often attended churches of different denominations with a couple of friends of mine and one night, we were at a well known AofG church with a large backing from " certain" local businessmen. One evening the pastor had passed the plate and didn't receive enough offerings, so he had the ushers lock the back doors and was going to pass the plate until he got what he as he said " needed." Where do they want the grain dumped? My SBC church doesn't even pass the plate. What if the church you attend(if you attend) has a pastor and staff which makes salary (which you accept as reasonable and prudent). Your kids enjoy the ministries. Your teens are being taught the biblical truths to grow and make a difference for Christ in their world. The budget is being met... then all of a sudden 1/2 of the church gets upset at something and begins to put their money elsewhere. They choose to support other para church ministries. Then the announcement comes. The church will need to begin cutting salaries and ministries. The staff leaves and the pastor finds the need to become bi-vocational. The downward slide sees families leave because the ministries are no longer there for their children. The demand upon the members pocketbook is to great to make up any difference. The pastor asks for more to be given, only to be mocked. The pastor says he is not seeking a tithe because the tithe will not cover the deficit. The doors close. The pastor is blamed. The upset church members walk away giddy, looking for another church, another pastor to scrutinize. Another sermon on giving to demonize. The local church is the Lord's and deserves our encouragement not our complaints. It deserves our support not our lack of. Yeah, yeah.. I know most here will disagree but the bigger picture needs to be considered. If everyone took the giving heart towards the church most on this blog seem to relish, the church house will soon be without and those who have fought to see the monies reduced will end up hurting a lot of wonderful people who continued to love their church. Retribution is fun, when you think you are on the winning and/or just side. But hey...Maybe some things really don't matter. Jon - sounds like that is YOUR story. If so, sorry that happened, but your church and all organized 501(c)3 churches really are business operating in a consumer-driven market. Mega churches realize this, as evidenced by their hiring of marketing experts. Not my story but the story of too many churches in decline. Churches need monies to operate and those who attend and deserve ministries to help them grow and be encouraged need to support the church. The anti-church rhetoric -anti giving differences - needs someway to seek why the men you disagree with - really - teach tithing. Some godly saints, historically, have believed in and taught the tithe-do you believe they were wrong? If it is the style that sets you off,that is a whole different topic. If one is going to stand on the unbiblical position of the tithe, then they really need to speak against all those historically who spoke for it. Why? Because that is where the seed was planted that the tithe was expected. Not expecting most here to agree and I am fine with that. It is not my place to teach those here but hopefully an honest and respectful dialogue can happen. We will see. I agree with you that there are good, honest churches out there which deserve member support. But those aren't the churches which this blog targets. The churches blog takes to task on here are the megachurches with celebrity pastors who are pulling down fat six (if not seven?) figure salaries, writing books and hiring literary agents, and building ridiculous theme park-scale entertaininment venues that they call "churches" to draw the masses in to feed the machine. And to feed the machine, they play mind games with their congregants and preach all kinds of heretical things about tithing which are directly contradictory to New Testament theology on giving. In a nutshell, their brazen message is "give us at least 10% of your income, or God is going to smack you down." These churches are NOT worthy of one cent of people's money, and it is my sincere prayer that in the future they will not exist. So, I guess I don't think it's fair for you to criticize this blog as "anti-giving." In fact the author has made it clear that his problem is NOT with giving, it is with these hucksters who twist Scripture to dun their people for money so they can squander it on their vain ambitions. Some mega churches pay their former pastors (retired ones) $150,000+ a year. This is far more than 99.8% of all those that retire from real corporations. Disgraceful. No wonder some churches go out of business. "The Giving of Tithes and Love Offerings"
So if a person believes in tithing, it's covered, or if you deny the teaching of the OT Tithing method and embrace a New Covenant giving method, there is no excuse for opting out, for the "Love Offering" addresses that as well. And I personally love it when the pastor boasts and brags from his pulpit that "me and my wife even tithe on all of our insurance plans as well!" Code words, "see how great and wonderful we are and since all of you want what we have, then you need to do the same thing with YOUR MONEY!" And more of the same; the pastor returns from his synod pastor's conference and brags from the pulpit, "Yes, our church was called out as being generous givers, one of the best givers in the synod." .....as new administrative buildings are built and salaries are increased....meanwhile the poor in our own churches are being ignored by the true Body of Christ. Hold on one minute Jon...if God called you to pastor a church,HE WILL SUPPLY ALL OF THE CHURCHES NEED!!! !now I know people give....but God will send people to support the ministry....WHICH IS SUPPOSED TO BE OF GOD ANYWAY...AND NOT MAN SAYING GOD CALLED HIM!!!! Jon L. Estes, I would be happy to discuss tithing with you. Pastors who teach tithing are either theologically ignorant or manipulators. These are the only two options. Those who pay tithes prefer to have the scriptures spoonfed to them rather than read the Bible for themselves. First, you will quote Malachi 3. I will point you to Malachi 1. Next you will offer this ~ Matthew 23:23 : "Woe to you, scribes and Pharisees, hypocrites! For you tithe mint and dill and cummin, and have neglected the weightier provisions of the law: justice and mercy and faithfulness; but these are the things you should have done without neglecting the others." I will respond that Jesus was a Jew speaking to Jews when the Law was in force. The new covenant began after the cross. Then you'll point to first fruit giving, and I'll hand you this ~ Acts 21:25: "But concerning the Gentiles who have believed, we wrote, having decided that they should abstain from meat sacrificed to idols and from blood and from what is strangled and from fornication." No mention of tithing, is there? There is plenty on giving, but never under compulsion. Lastly, I will ask you what God has said about adding to His Word, because that is exactly what tithe teachers are doing. I believe it goes something like, "Let him be cursed." Putting God's people back under the Law is serious business, and especially when it's for filthy lucre, wouldn't you say? You know Jon these conditions existed in the first four centuries of the church, and well THEY GREW. I will add though biblically speaking that Paul wrote to the assembly in Thessalonians that elders should NOT burden the flock in support and then to Timothy that as an assembly prospered an assembly should not muzzle the ox and even that the farmer could have a share in that abundance the Didiache suggests this as well. The issue is not welfare of an assembly which by the way if one is blessed by and able to so do then they should give and not with a grudging spirit as stated in Corinthians, it rather the abuse of tithe teaching that Floyd that does not even follow Paul's instructioon. Even Paul admonishes the Galatians for being seduced into circumcision conversion heresy and ignoring the the fact that they were still in violation of other aspects of the Torah. That is exactly what tithing sets up a person in doing and how Malachi 3 misleads a Christian for being under a curse if they DON'T tithe. The tithe is for the land of Israel only any other teaching becomes foundation for replacement theology. Do you see now Jon where exactly Floyd is erring? Yet, you are to say this is a materialistic argument and assuming programs would get cut if people are not on board with this. There are a number of assemblies that DON'T teach tithing AT ALL and ARE growing. The LORD loves a CHEERFUL GIVER not a begrudging one. I will respond for Tom. Yes, they were wrong because by such assumptions of replacement application in thus they also planted the seed of replacement theology. Good dispensational theology has to be Israel sensitive or it becomes skewed. "Hold on one minute Jon...if God called you to pastor a church,HE WILL SUPPLY ALL OF THE CHURCHES NEED!!! !now I know people give....but God will send people to support the ministry....WHICH IS SUPPOSED TO BE OF GOD ANYWAY...AND NOT MAN SAYING GOD CALLED HIM!!!!" The picture is much bigger than what you are saying. To your comment above... I disagree. Just because God calls someone to do something does not immediately take mans free will out of the equation. When speaking of a group (like a church body), God will allow for His people to be stupid and miss the immediate blessings God wants for them. God has a permissive will. In that permissive will He will "allow" for failure. A good example would be...When God freed His people from captivity in Egypt His perfect will was for that generation to inherit the promised land. Yet because of the free will God built within mankind, they made sinful decisions. These decisions cost them the joy of entering the promised land. Are there men in pulpits which have not been called? I think so. Are there church members who are called to start blogs exposing that which they see as wrong? I do not think so but many others do. Every mans story is different. I know my calling from God to serve Him in vocational ministry. I do not have to attempt to convince anyone else. I know I am called to pastor just as much as Mary was called to carry Jesus(I am working on a sermon dealing with the passage on Mary's song)... I gladly admit that she fulfilled her calling better than I am fulfilling mine but that is a different topic. I know from this passage that she had to endure the critics of her time because she was an unwed mother to be. People just could not grasp the fact God had a calling upon her life. I think there were probably times she struggled with this also. Bottom line...God uses His people to supply the needs in the church and He will allow the church to implode if His people choose themselves over Him. God doesn't need us but He wants us to need Him. If God puts me in a church where it takes a lot of money to operate, then I am responsible to help it operate. I do wonder why God would put anyone in a church to work for its death instead of its growth. Is it possible that many angry church members are so smug, they can't even find joy in giving to something they are called to be a part of. Then again, if God has not called them to be a part of a specific church why not take your own advice and let God supply or take away the resources. It does seem many think God needs their help in keeping funds from the church but not their help in keeping funds in the church. "Some mega churches pay their former pastors (retired ones) $150,000+ a year. This is far more than 99.8% of all those that retire from real corporations. Disgraceful. No wonder some churches go out of business." Is this sinful or just something that bothers you? Autonomy is an odd thing. Letting a church decide on how God wants them to invest the money they are stewards over should be a local church decision. It is possible that everyone who comments on this blog would take the same offer from their employer if made. I would guess the members who made such a decision possible were godly men. I would also guess that the former pastors, some those here might truly love and admire, were offered something similar and took it. "Autonomy is an odd thing. Letting a church decide on how God wants them to invest the money they are stewards over should be a local church decision." As a SBC pastor I whole heartedly agree. Autonomy IS an odd thing. Which is precisely why Ronnie Floyd, or any SBC officer should never write such a blog essentially stating they know how a church/pastor should handle tithing in the local setting. I have never, and will never, teach obedience is tied to giving. I have always, and will always teach stewardship which is a much larger scale of teaching then merely forking over 10%. The idea that someone can simply hand over 10% and irresponsibly spend the other 90% and still be "obedient" to God is ridiculous, but that is precisely the idea embedded in such a demand from guys like Floyd. it sums up the tithe abuse and greed of some preachers. It sounds like the 10% tithe requirement is the modernist's version of medieval indulgences. Jon re:$150,000 yearly retirement from any church is disgraceful. No it doesn't bother me as I would not provide one cent toward that. The Law condemns. The Jews were under the Law and were obligated to provide 10% to the Levites in order to accomplish what God wanted. Under Grace there is no reason for anyone to be placed back under the Law since no condemnation is possible for those in Christ Jesus. Requiring anyone to accept the burden of giving 10% to an organization is a clear falsehood. Well said, Anon, very well said. I went back and checked to see if that comment ever made it out of moderation and saw that his post on year-end tithing has no comments at all. Did he shut them down?